Earlier this year, IMCORP was performing its Factory Grade® assessment for a utility client and detected PD at 1.3 times operating voltage at the far end termination (not meeting IEEE 386 requirements). The crew was instructed to clean and grease the elbow, but subsequently the PD activity persisted during the retest. The crew removed the elbow to further investigate. Here, they discovered a potentially severe installation error. The semi-con cutback—the most critical, high stress area of a cable termination—featured a jagged, non-radial cutback (IEEE 386 non-compliant). This is a very common installation error. A non-radial cutback concentrates electrical stress at a singular point and commonly leads to the of cable system failures. 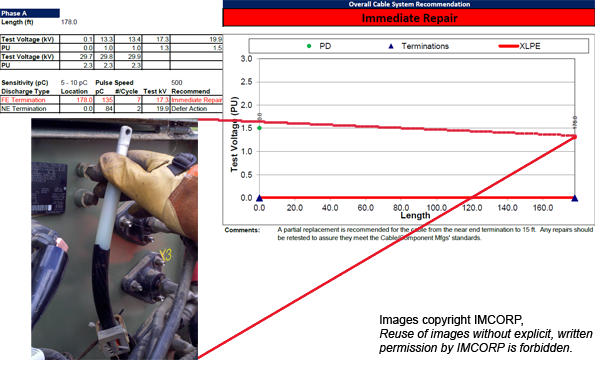 Since there was not enough excess cable to perform a full re-termination (cut off the old termination and redo the cutback), IMCORP recommended an extended termination repair to fix the defect.